What: A vegan dessert using beans(!) that is healthy-ish and tastes just like cookie dough – I know, I couldn’t believe it myself! Vegan Cookie Dough Oat Bars! No bake and prepped in no time! When: This recipe is a great way use of leftover chocolate chips in odd amounts – you only need a 1/4 cup. This snack/dessert is also a winner when you need to whip up something no-bake in a pinch using pantry items! Why: Even though I am not a huge fan of hiding vegetables in foods to get your kids to eat them (I believe that we have to normalize veggies by having them appear obvious and often in everyday favorite foods- more about that HERE), there’s absolutely nothing wrong with adding extra nutritional punch to dessert. One batch of these amazingly tasty vegan bars includes about a half a can of fiber-packed beans. Not only are the beans undetectable, but they lend additional satiety to this comparatively virtuous dessert made only with natural sugar. Additionally, these are dairy free, egg free, and can be made with or without nuts as dictated by your family’s dietary needs and preferences. How: Have a food processor? Then you’re 10 minutes away from making these. You can use a blender as well, but see below for those instructions. Makes 1 8×8 Pan, cut into cubes, bars or squares as you wish. 1/3 Cup Honey (you can use pure maple syrup or agave as well) – taste and add more as desired but 1/3 Cup was sweet enough for me! Line an 8×8 pan or pyrex with parchment paper or wax paper. Drain beans into a colander and rinse them quite well several times. Using a food processor, blend all ingredients except your chocolate chips. Be sure the mixture is very smooth. You can use a blender but it won’t work quite as well and you should stop several times to ensure ingredients are mixing evenly. Stir in the chocolate chips and spoon the mixture into the prepared pan. Smooth the top using a spatula. Freeze. Once chilled (2 hours or more), remove from the freezer and lift the parchment paper out of the pan. Cut into bars or squares and allow to come to closer to room temperature to serve (though they are good chilled as well!). To store, arrange them in an airtight container with parchment in between layers of the bars. Why: Arrowroot Cookies are a classic for kids. Arrowroot Flour always catches my eye in the health food store, and so I’ve always been curious about it. Given this, it only made sense that I should try and recreate a childhood favorite. Turns out Arrowroot itself is pretty interesting. A starch derived from tropical plants, Arrowroot Flour is known for being easily digestible and the plant itself was prized in ancient Central American cultures. Once I got my hands on a super simple recipe from another blogger, I was pleased both by how fast the easy dough came together, the equally quick bake time and of course the results. The original recipe from Someone’s In The Kitchen Blog appears below with my only change, the addition of a 1/2 teaspoon of Cinnamon, a favorite spice in our house, and the fact that I used light brown sugar instead of dark. Either would work. Kids and adults of all ages will enjoy these simple, homey treats, and you will love the cost savings as compared to other kid’s crackers. How: Make them super basic as we did, or you could get creative and cut the dough into letter shapes, stamp it, decorate with a fork as I did, or even engage your kids in the effort. Add vanilla and egg and beat well. Sift together flours, baking powder, salt and cinnamon if using. Combing dry ingredients with egg mixture and mix until incorporated. Turn dough out onto a lightly floured surface and roll into about ¼ inch thickness. Cut into desired shapes and put cookies on a parchment lined cookie sheet, not too far apart as they will not spread out when baking. Bake for about 10 minutes or until lightly browned. Boo! It’s Halloween, and we here at Neurotic Mom hope you’re looking forward lots of fun activities with your little ones this creepiest of evenings. Even if your trick-or-treating already happened this weekend, there’s still time for a spooky, edible craft that will delight big and little diners alike, with none of the commitment of cupcakes or other more involved baked goodies. You don’t even have to turn on the oven. As you can see, these don’t have to be perfect to look positively adorable and delicious! Grown-ups: are you headed to a party empty-handed? 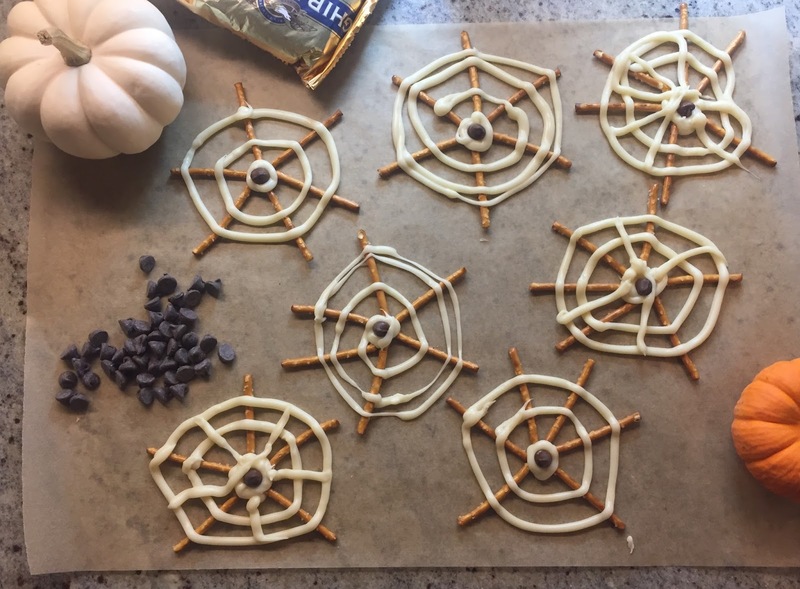 These whimsically sweet spider webs come together in ten minutes (just leave a half hour for them to firm up). With only three ingredients, they can be ready in a flash. For the easy HOW TO head to our sister site Neurotic Kitchen (the place for easy and elegant recipes for the busy home cook with a day job!). Parenting is hard. Food should be easy. Follow neurotic-mom.com for fast, nutritious recipes your little ones will love.